Bali always has an itinerary full of celebrations filled with action and vibrance. With pure dedication to the rotating 210 day calendar named ‘Powukon’ lifestyles are followed everyday from household chores to celebrations and making decisions about life paths through this calendar. As April comes around each year it is a very special month of festivity in the calendar. Galungan is a time where Hindu’s celebrate the triumphant battle of good versus evil and /or the advancement of Hinduism. Galungan is starting on Tuesday the 4th of April and also the following November the 1st 2017. Galungan is a unique welcome to Bali if you choose to arrive at this time. Kuningan follows 10 days (14th of April) afterward Galungan - the Balinese believe that this is the time when the gods and ancestors find their way back after visiting earth during the celebration of Galungan. During this time preparation for Galungan consists of nothing but busy locals! Killings of chickens and pigs to later feast on, communal gatherings, offering making and traditional baking of ‘jajan’ Balinese cakes all contribute to the arrival of this day. The men of the villages collaboratively make ‘penjor’ which are large bamboo poles that are naturally curved at the top and are intricately decorated bearing offerings of fruit, rice and coconut leaves. These penjor are seen throughout the streets and in the entrances of family compounds resulting in colour and serene decorational beauty across the island. Families collectively bring offerings to extended family households and to the local temples where they share and enjoy family company after praying. A holiday time for going back home and spending time with relatives upon its climax on Wednesday April 5th and November 2nd 2017. Kuningan Day is when Sang Hyang Widhi (god) gives the blessing of prosperity to the whole of the world. The 10th Full Moon ‘Purnama Kedasa’ commences on the 11th of April. This is celebrated in major temples across the island but in particular at the famous Mother Temple - Besakih which holds a sacred ceremony called ‘Betara Turun Kabeh’ which invites the gods and ancestors to give their blessings. 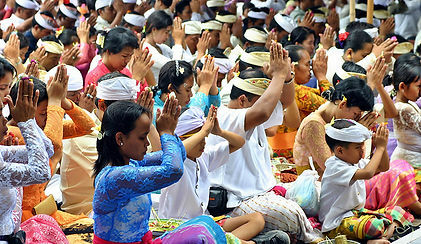 Pilgrimages, purification - Melasti takes place the following Sunday where processions carry sacred objects from the temples and tirta ayu (holy water). Three of our dearly loved staff staff members Yuni, Tison and Bagus (Mr Good) all share birthdays during this festive month. When Yuni came to work at Aquaria she couldn't speak English. We didn’t think that this would matter as she was only in the office, but we sent her to English school. It soon became clear that we needed her front of office. She bravely faced the guests and learned English, stumbling along…..until suddenly she has broken out…. Her face all smiles, she understands now what we are saying. She is proud of herself, and excited at her new knowledge and understanding. Now she just thrives on helping guests and is not shy to ask for help. She is magic on the graphics computer, making flyers and posters and menus, always willing to try anything and always has a smile. She is part of a very close knit and beautiful family. We were lucky enough to be invited to her and her siblings tooth filing ceremony, and also to her capping for her Economics University degree, which she had studied part time whilst working at Aquaria. She has blossomed in front of our eyes and we are so proud to haveYuni with us and the team at Aquaria. Wayan Tison came to Aquaria on a 3 month work experience from tourism school. He was so handy and willing that we asked him to stay part time whilst he finished his schooling and then when he had finished we asked him to stay full time. 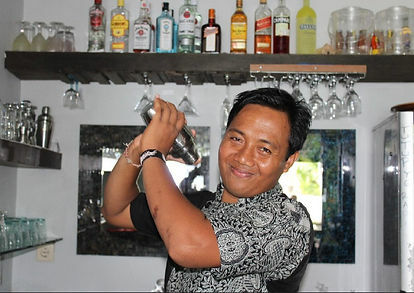 He proved to be a Jack of All Trades, and the one that Ketut, our manager, calls on in a mechanical emergency. Very skilled with his hands across all departments. Whether its cleaning, waiting on tables, barman, cocktail maker, plumber, electrician, builder, gardener, . – he can do it all. I expect that being an ace card and domino player has also given him his ability with maths, . He is like a sponge – willing to learn everything. He is a bit of a perfectionist and likes everything to be fair within the Aquaria family team. His abilities have been under used up until now…. Or maybe “over-used” – this is the problem when being good at everything! He appears so serious and so he was nicknamed “grandpa” by Deng, but when you get him to smile, his face lights up and he is so handsome and can be so charming when he chooses. He is constantly keeping us on our toes , and amused. Life at Aquaria would be so boring without Tison. Bagus has been one of our very original staff members since the beginning. His name Nyoman Bagus means ‘good’ but sometimes he is ‘nakal’ (naughty). Bagus has been with us since he was 18 years old. He came with minimum experience and little English. Now he is number one in restaurant. Always calm, lets nothing upset him, always C'est la vie - thats life! Why worry about it? But we all ask, when will he be married ? … Maybe this year! You never know with this one. Bagus always manages to make guests laugh and smile, his humour and lightheartedness makes him shine.He has been through some tough times and we are really proud of him for facing adversity and getting through it all still smiling..
April is the one of the hottest months of the season… the sunny days have arrived! It is not too windy and the sun is out. The high season is approaching after the Easter holidays it can be a crowded time due to an influx of visitors. I would love to be in Bali at this time to celebrate with close friends and family. But I hope that some of you who read this will enjoy it for me.